Confession: I’ve never been a big fan of deviled eggs. And this says a lot, because I eat all the food…and appetizers are my weakness. But for some reason, I could always pass up the deviled egg tray. But these babies have changed all that. Because bacon. Oh – and cheddar. 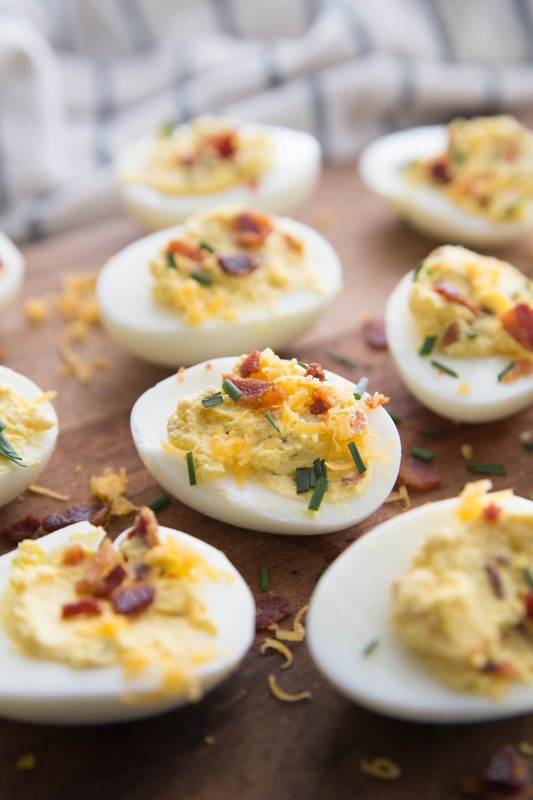 I know deviled eggs are their own thing, but is there a better combo that bacon, eggs, and cheese? And a little chive for good measure? These are some serious yum. 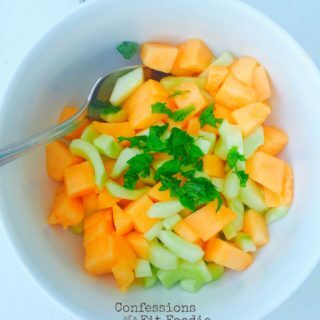 I could actually imagine prepping these for a snack, too, because they are SO filling! 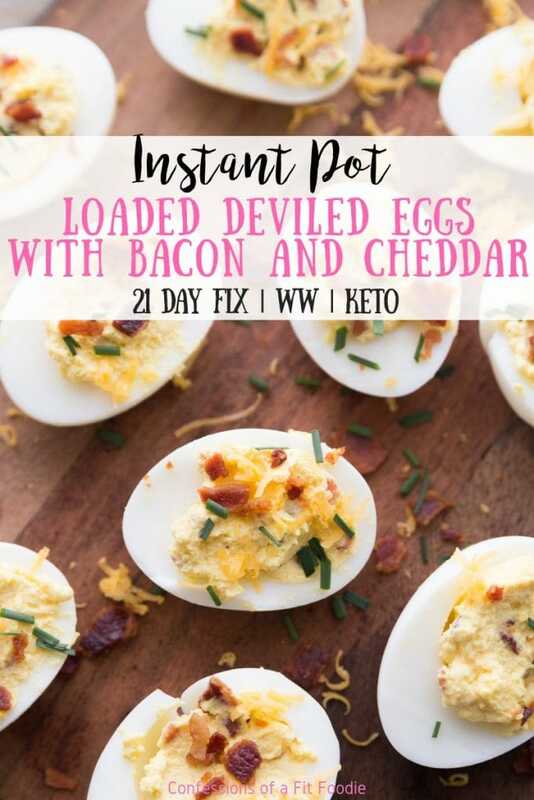 And thanks to the Instant Pot, making deviled eggs – or any kind of hard boiled eggs – has never been easier! To make these Instant Pot Deviled Eggs, we are going to start with the 5-5-5 Method for Hard Boiled Eggs which is cooking your eggs for 5 minutes on the manual/pressure cook setting. If your Instant Pot has a egg setting, you can use that! Some of the newer models have this setting and I’ve heard it works awesome. After cook time, you want to do a 5 minute Natural Pressure Release which means you do nothing after cook time ends for 5 minutes and let the pressure begin to release on it’s own. I usually set a timer because these people I live with will interrupt me a million times before that 5 minutes is over and I will forget. After the 5 minutes, release the pressure the rest of the way. 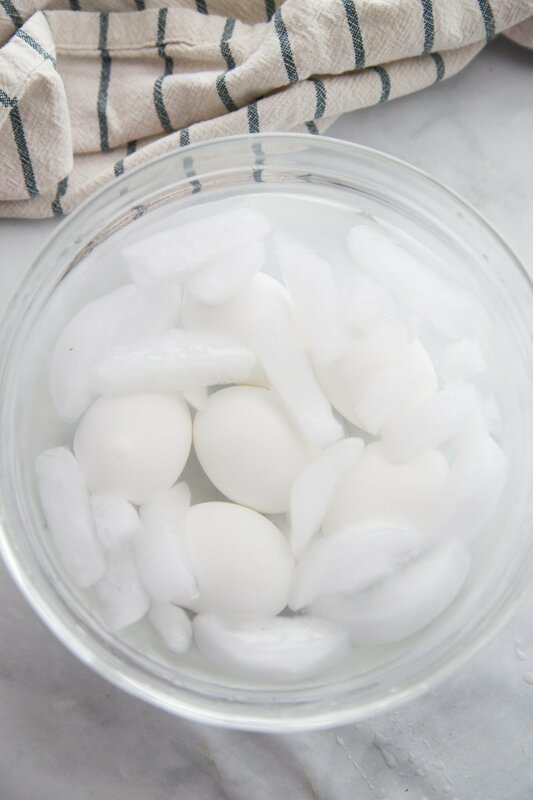 Then you give your eggs a nice little ice bath for 5 minutes. 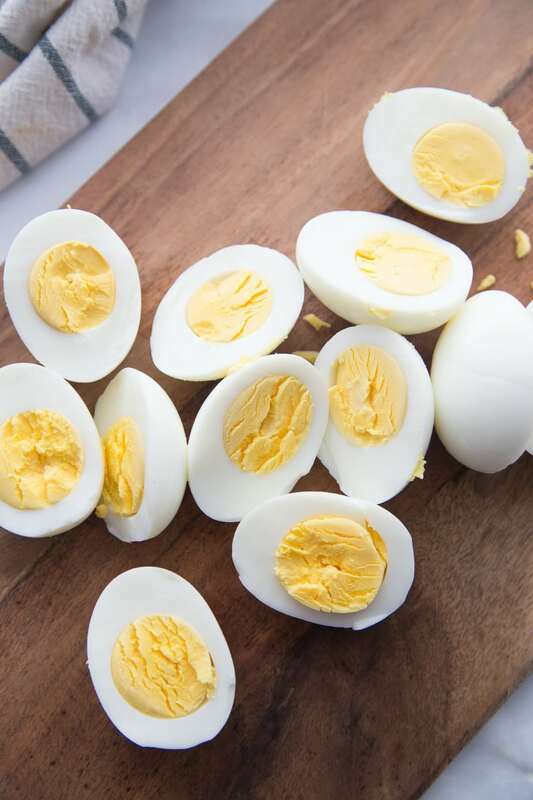 This will result in the easiest to peel, more beautifully cooked hard boiled eggs ever! Look at them! Now you are ready to fill your eggs! For my deviled egg mixture I used bacon, cheese, mayo, greek yogurt, salt, and a tiny bit of mustard. 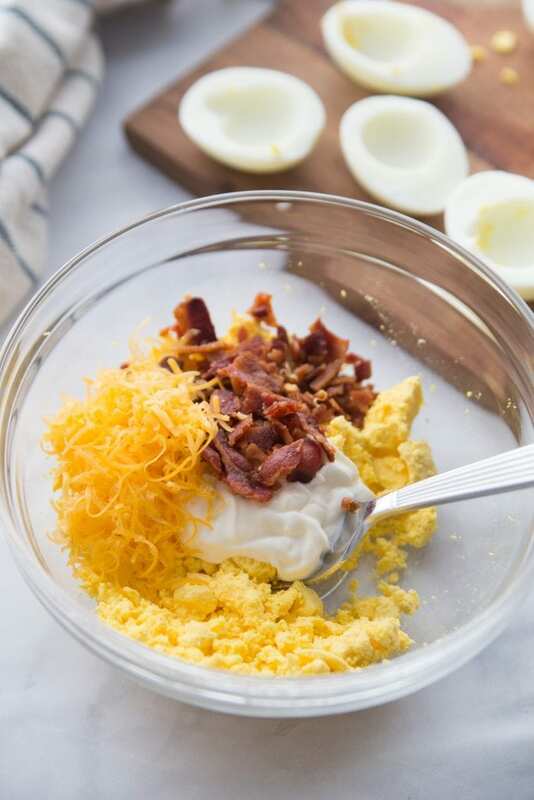 I spooned this mixture into my eggs and then topped with extra bacon, chives, and cheddar! 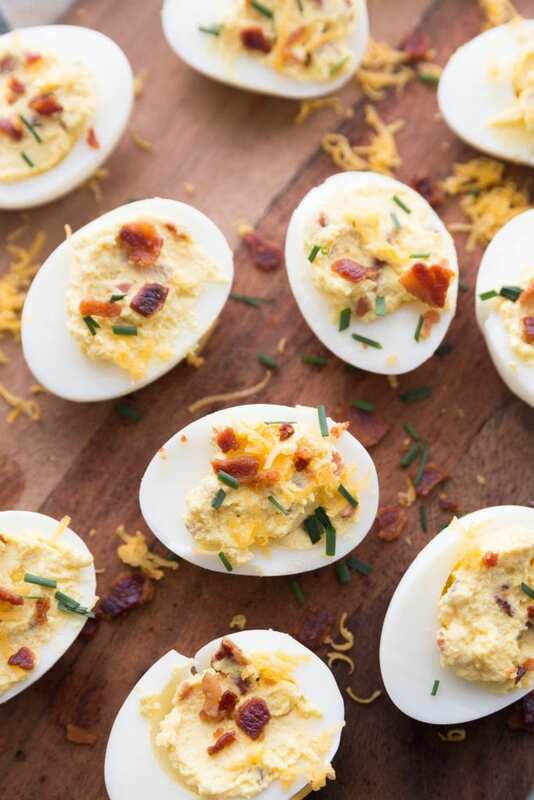 Can I make these Instant Pot Deviled Eggs in advance? You can fill your eggs the night before you need them, but it’s best to fill your eggs the day you are serving them if your Deviled Eggs are for a party. If it’s for a snack for yourself, they will keep for 2-3 days! 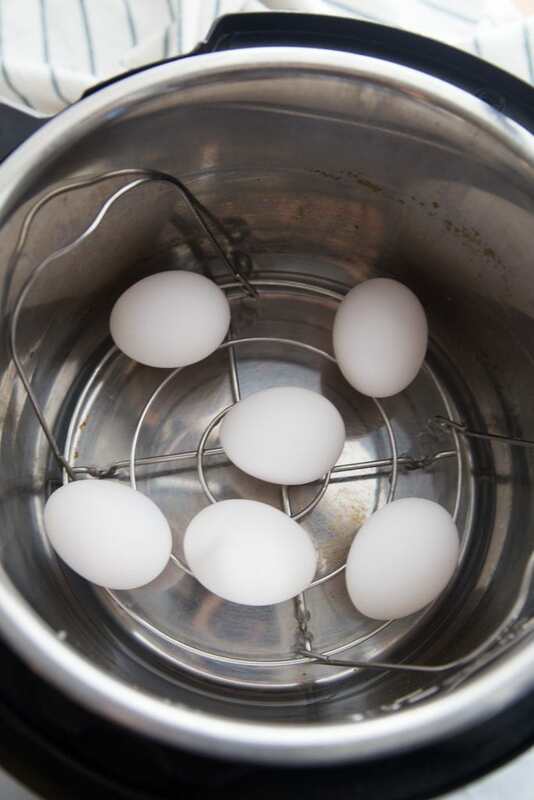 But, you can make your hard boiled eggs in advance – up to a week! Just store them in the refrigerator in the shell. And then the night before you need your deviled eggs, peel your eggs and mix up the filling. Store both in an air tight container in the fridge. 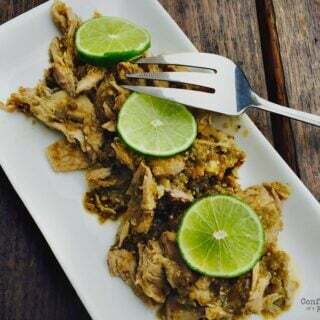 The next day, all you have to do in spoon the mixture into your egg halves and you are good to go! Or if you are fancy, you can pipe your filling. 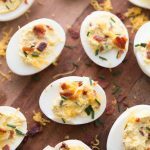 Are these 21 Day Fix Deviled Eggs low carb? These Instant Pot deviled eggs ARE low carb and make the perfect keto, or no yellow snack for 21 Day FIXers. And each Deviled egg half is only 1 Weight Watchers Freestyle Point! Woohoo! Can you make these Instant Pot Deviled Eggs without mayo? Yes! If you aren’t a fan of mayo, you can leave it out and double the Greek Yogurt for this recipe. 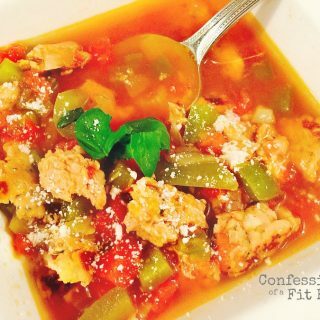 This removes the teaspoon container count for 21 Day Fixers, too! Woohoo! Can I make these Deviled Eggs dairy free? To make these dairy free, you will leave out the Greek Yogurt and double the mayo! 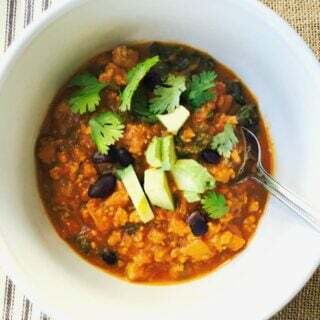 You can also sub in your favorite dairy free cheese or leave it out. It will still be delicious with the bacon! This would also make these deviled eggs paleo and whole 30 friendly. 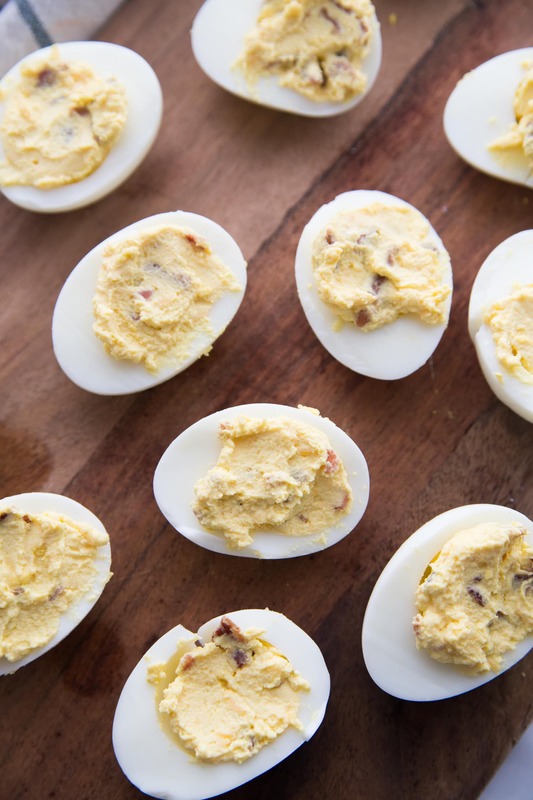 Want to see how to make these Instant Pot Deviled Eggs? Check out this video!